ORNL researchers used a new scanning transmission electron microscopy technique to sculpt 3-D nanoscale features in a complex oxide material. OAK RIDGE, Tenn., Nov. 9, 2015—Electron microscopy researchers at the Department of Energy’s Oak Ridge National Laboratory have developed a unique way to build 3-D structures with finely controlled shapes as small as one to two billionths of a meter. ORNL scientists happened upon the method as they were imaging an imperfectly prepared strontium titanate thin film. The sample, consisting of a crystalline substrate covered by an amorphous layer of the same material, transformed as the electron beam passed through it. A team from ORNL’s Institute for Functional Imaging of Materials, which unites scientists from different disciplines, worked together to understand and exploit the discovery. 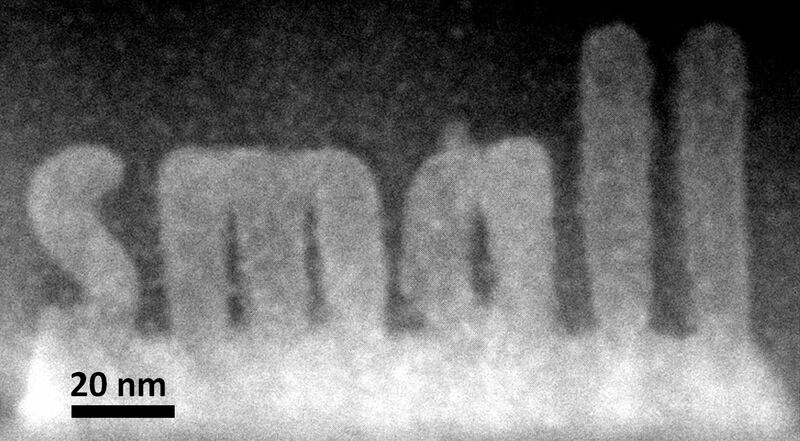 The use of a scanning transmission electron microscope, which passes an electron beam through a bulk material, sets the approach apart from lithography techniques that only pattern or manipulate a material’s surface. The technique offers a shortcut to researchers interested in studying how materials’ characteristics change with thickness. Instead of imaging multiple samples of varying widths, scientists could use the microscopy method to add layers to the sample and simultaneously observe what happens. Theoretical calculations on ORNL’s Titan supercomputer helped the researchers understand the process’s underlying mechanisms. The simulations showed that the observed behavior, known as a knock-on process, is consistent with the electron beam transferring energy to individual atoms in the material rather than heating an area of the material. Coauthors are ORNL’s Stephen Jesse, Qian He, Andrew Lupini, Donovan Leonard, Raymond Unocic, Alexander Tselev, Miguel Fuentes-Cabrera, Bobby Sumpter, Sergei Kalinin and Albina Borisevich, Vanderbilt University’s Mark Oxley and Oleg Ovchinnikov and the National University of Singapore’s Stephen Pennycook. The research was conducted as part of ORNL’s Institute for Functional Imaging of Materials and was supported by DOE’s Office of Science and ORNL’s Laboratory Directed Research and Development program. The study used resources at ORNL’s Center for Nanophase Materials Sciences and the Oak Ridge Leadership Computing Facility, which are both DOE Office of Science User Facilities.